Harmony was the lead engineer and provided hydraulic analysis, hydrologic analysis, geomorphologic review, and final construction documents for two bridges over Darby Creek at County Road S2000E and County Road S1000E. Harmony also provided permitting assistance to Teton County. The new bridges allow for conveyance of the 1% annual chance (100-year) flows under the structures and 2-ft of freeboard above the 2% annual chance (50-year) peak flow water surface elevations. Both roads were reconstructed at the bridge approaches in order to improve safety and bring the roads up to current County design standards. The crossing at County Road S2000E was constructed in 2014. Construction of the two box culvert crossings at County Road S1000E started in 2016 and was completed during the spring of 2017. Both projects demonstrate how county infrastructure can benefit from appropriate fluvial system restoration and safety improvement efforts. 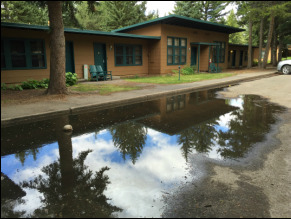 ​Jackson Lake Lodge (JLL) Stormwater Management Plan (SWMP) is a comprehensive overview of the existing conditions on the JLL property and a guide for future development and long-term maintenance of an integrated and functional stormwater management system. Objectives of the SWMP include: (1) develop solutions for current storm drainage problems and (2) provide an implementation plan for installation of stormwater management infrastructure and best management practices (BMPs). Two typical problems addressed are ponding in the parking areas after storms (see photo) and clogged storm drains. Harmony was the prime consultant and lead author responsible for completing a comprehensive update to the 2005 version of the Idaho Department of Environmental Quality (DEQ) Catalog of BMPs for Idaho Cities and Counties, which is expected to be released in 2018 or 2019. Harmony collaborated with DEQ staff and subconsultants, Stantec Consulting and Geosyntec Consulting, who provided QA/QC services. The update includes changes to make the Catalog easier to use, additions to the Catalog, and revisions to more than 100 temporary and permanent BMPs. Harmony composed new chapters on green infrastructure, low-impact development, cold weather climates, mountainous terrain, and innovative BMPs. Each BMP fact sheet was edited to include prescriptive design guidance while incorporating the latest technologies and practices. Each BMP fact sheet was edited to include photos and description of the BMP, information on where and when the BMP is most applicable, what limitations may affect its use, as well as design, construction, and maintenance guidance. The primary objective of the Gros Ventre restoration project was to stabilize approximately 700 ft of stream bank that was rapidly eroding and contributing excessive sediment to the watercourse. Proposed activities include installation of rock and log stabilization structures in concert with bioengineering treatments and floodplain bench creation in order to maintain floodplain connectivity while achieving bank stabilization objectives. Harmony Design & Engineering completed hydraulic analysis of the restored river reach using HEC-RAS, assisted with cross section placement, and prepared necessary floodplain development permit applications for Teton County, Wyoming. This project provided updated flood hazard data to help the Federal Emergency Management Agency (FEMA) and the local, regional, and state agencies deal with existing and increased flood hazards caused by the 2008 floods in Iowa. Flood Recovery Maps in digital GIS format with accompanying reports were produced for sixteen Iowa counties. This project had a very short time-line and Harmony Design & Engineering worked closely with a large project team headed by URS Corporation to get the project finished on time and within budget. Harmony Design & Engineering analyzed and processed topographic data, conducted hydrologic analysis using ArcHydro, conducted hydraulic analysis using HEC-RAS and HEC-GeoRAS, and produced flood hazard delineations for 469 stream miles in Mitchell County. All data produced met FEMA Data Capture Standards and FEMA’s Guidance and Specifications for Flood Hazard Mapping Partners. This project included the replacement of two bridges along Badger Creek and stabilization of the creek at County Road W10,000N and County Road N3000W in Teton County, Idaho. The design team was lead by Harmony Design & Engineering and included Jorgensen Associates and Biota Research and Consulting. This team worked together seamlessly to provide surveying, hydraulic analysis, hydrologic analysis, morphologic review, structural engineering, and final construction documents for the two bridges and associated bank stabilization. Hydraulic analysis of the bridges was completed by Harmony and the new bridges allow for conveyance of the 1% annual chance (100-year) flows under the structures and 2-ft of freeboard above the 2% annual chance (50-year) peak flows. The project was implemented in 2012, and the effort restored proper fluvial process, protected public infrastructure and safety, and addressed flood conditions that have destroyed Teton County roadways numerous times in the recent past. This project is an intensive stream and riparian restoration project along almost 1 mile of Teton Creek. As a consultant to Teton County, Harmony provided bridge design plans which included horizontal and vertical layout, scour analysis, footing design and wingwall design. The Teton Creek Bridge replacement was an important first step to the restoration project which began during the fall of 2013. The new bridge allows for conveyance of the 1% annual chance (100-year) flows in Teton Creek and 2-ft of freeboard above the 2% annual chance (50-year) peak flows. Harmony also provided HEC-RAS modeling of Teton Creek which was used as the basis for the restoration design and channel modifications. Harmony also completed the CLOMR application for the restoration project and is in the process of completing the LOMR for the stream restoration project.